There are a few things you need to know before you go running into the theatres to catch the dishy Chris Hemsworth doing his stuff with that hammer - (i) there is no point watching Thor: The Dark World, if you have not updated yourself with the previous Thor movie, and more importantly, The Avengers; (ii) you must have some idea of Norse mythology; (iii) do not expect fireworks between Thor and Loki; (iv) do not expect a love story; and (v) this is the eighth Marvel film in recent times, all connected. Once you are ready with this knowledge, prepare yourself for the visual treat that Chris Hemsworth is (despite the red cape that reminds you of Superman, sometimes). 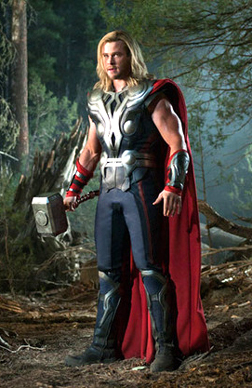 Thor (Chris Hemsworth) is back in Asgard after a two-year war to bring peace to Vanaheim. In the meantime, Loki (Tom Hiddleston) is in prison because of the havoc he created in The Avengers. Frigga (Rene Russo), his foster mother, tries to make him as comfortable as possible, but Loki sulks and paces his cell. Odin (Anthony Hopkins) is ready to hand over his throne to Thor, but before he can do that, disaster strikes. During the time of Bor, Odin's father, the Dark Elf Malekith (Christopher Eccleston) had tried to imbibe the deadly Aether, a fluid weapon, at the exact time that the nine realms converged - a phenomenon that occurs once in many thousands of years. This would have made him very powerful, and destroyed all the peace in the Universe, but Bor stops him in time. Malekith escaped, and remained suspended in time, waiting for the next convergence. Bor had put the fluid inside a stone column, and buried it deep in an unknown place. 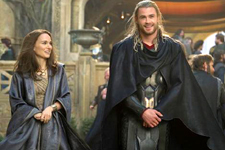 In present day London, Jane Foster (Natalie Portman), who is finally trying to move on with her life after the disappearance of Thor, comes across this stone column, and the fluid takes over her body. The sleeping Malekith awakens. And convergence is just around the corner. The heartsick Thor, when informed by Heimdall (Idris Elba), the Asgardian sentry, that Jane is not visible to him, rushes to Earth and finds her. He then brings her to Asgard to cure her of the infection that may lead to her death, but Malekith strikes. Back on Earth, Jane's intern, Darcy (Kat Dennings), rescues the clinically certified insane Dr Erik Selvig (Stellan Skarsgård), Jane's mentor, from a psychiatry ward, so that he can come up with a solution to stop Malekith. In the meantime, Thor is forced to seek Loki's help in setting things right. At a little less than two hours, that is a lot of drama for one movie. Which basically means that the screenplay has no time to dawdle over emotions and romances. The lack of the above is a disappointment, considering that Loki and Thor make up, in a way, and that Jane and Thor meet after a long separation. And then there is the relationship between Odin and both his sons - this, too, has been dealt with very shoddily. A tragedy in the family is dealt with in a similar manner. The reason for Malekith's ambition is rather ambiguous, and he is not as menacing as Loki himself was in The Avengers. What the story does have, though, is plenty of action. There is nothing you have not already seen in terms of fights, but all the sequences in between the violent ones begin to feel like fillers. The genre, which was earlier about interaction between Gods and human beings, now has elves that make it almost a sci-fi alien movie of sorts. The other positive aspect of the movie (yes, there are only two) is the humour in the dialogues and the situations. Together, the action and the dialogues make Thor: The Dark World a masala movie that can put our own Bollywood to shame, and of course, one needs a willing suspension of disbelief to really enjoy it. Chris Hemsworth, after his passionate depiction of a race driver in Rush, seems a bit toned down, but he still looks good enough to convince us that he could be a God. Since the story has no intense emotions, he does not have to emote too much. Tom Hiddleston is obviously a better actor, but he is a little subdued, too. Natalie Portman, on the other hand, seems quite pepped, and is more likeable here than in the previous movie. Stellan Skarsgård is sidestepped, but he manages to create an impression. Anthony Hopkins looks confused, and Rene Russo has more screen time this time around. Idris Elba, on the other hand, is unfortunately hardly there. The movie was not shot in 3D, as is obvious from the sequences that you can take your glasses off for. There seems to be no need for the extra dimension, and maybe a 2D version is a better bet. The cinematography, although not really to be blamed, is sometimes lazy - there is a lot that could have been done with the bifröst bridge sequences, and the constant travelling between dimensions and portals. The production design is repetitive, and there is nothing that will dazzle you, although the prison cell concept seemed pretty neat. The costumes are sloppy, too. The music is catchy, and the editing is above average. Thor: The Dark World is essentially a sequel to The Avengers, and a stop-gap arrangement before the next instalment of the same, as well as a third Thor movie. If you know this and are okay with it, then you will have fun watching the movie. Do not expect anything else, and remember, Loki is the master of illusions, so keep your eyes and ears open. Be the first to comment on Thor: The Dark World (3D)! Just use the simple form below. fullhyd.com has 700,000+ monthly visits. Tell Hyderabad what you feel about Thor: The Dark World (3D)!